This is a really delicious breakfast, or any time of day, treat. And you can use your bananas and blueberries from the freezer! You probably have everything you need for this, already in your cupboards and freezer. If not, put these ingredients on your list so you can make this SOON! Start by creaming together the butter and sugar. 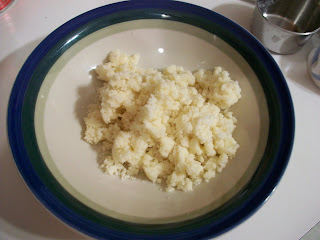 Add 3/4 cup of the flour and stir or beat just until the mixture resembles coarse crumbs. Then remove 3/4 cup of the crumbs and set aside. 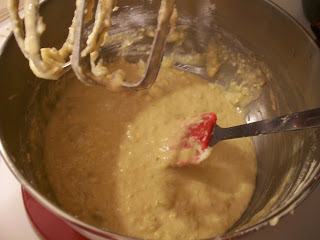 To the remaining butter/sugar/flour mixture in your mixing bowl, add the rest of the flour and dry ingredients and mix until combined. In a separate bowl, combine the eggs, mashed bananas, milk and vanilla. Stir into the dry ingredients just until blended. It's ok if it's still a little lumpy. Fold in the blueberries, then pour into a well greased 8 or 9 inch pan. Top with the reserved crumb mixture. Bake for 25-30 minutes or until topping and cake are both golden brown. The original recipe says to serve warm, but I ate it cold and it was perfectly delicious. Get more great recipes at Food on Friday, Family Recipe Friday, Foodie Fridays, and Friday Feasts. Cream together butter and sugar until smooth. 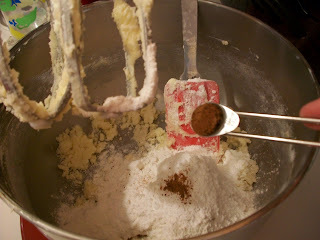 Add 3/4 cup of the flour, and beat just until mixture resembles coarse crumbs. Reserve 3/4 cup of the crumb mixture. To remaining butter/sugar/flour, add 1 cup flour, baking powder, salt, baking soda and nutmeg. Mix until combined. In a separate bowl, combine eggs, mashed bananas, milk and vanilla. Add to the dry ingredients and mix just until moistened. Fold in blueberries. Pour into a greased 8 or 9 inch pan and sprinkle with the reserved crumb mixture. Bake at 375 for 25-30 minutes or until both topping and cake are golden brown. Serves 9. Wow, I posted that blueberry coffee cake last week, and now you've added yet another wonderful flavor to the idea--bananas! And I had some I could have used for mine last week. Well, now I have a new option for next time. Thanks for the recipe! 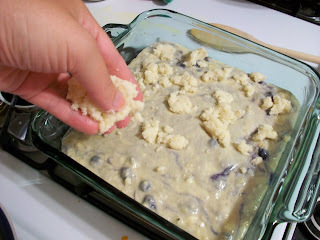 Bananas and blueberries together in a coffeecake? Oh yes, this is a keeper and I want some right now. I'm having company this weekend and this will be welcoming them upon arrival with a big pot of coffee. I'll bet these are delicious. They certainly look wonderful. I hope you are having a terrific day. Thank you for baking from scratch! Looks wonderful. This sounds wonderful. Great flavor combintation! Thanks for sharing. I hope you will join me for Crock Pot Wednesday next week at diningwithdebbie.blogspot.com. Thanks again. 2 of my daughters favorite fruits together in a cake. This will be a hit in our house! Thanks for sharing. used OJ instead of milk . . . 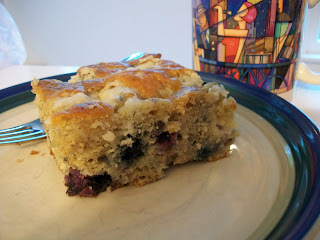 I just made the Banana Blueberry Coffecake and it is de-licious! I only had one banana so I added about a 1/2 C of plain yogurt in place of the 2nd banana. Also, I was out of nutmeg so I used cinnamon. We have one blueberry bush on our property and I had just picked and frozen about a gallon of large blueberries! This recipe was moist and very tasty. Thanks, Elena Blthe! !